The husband and I spent our first Thanksgiving in China. We had shrimp and corn on the cob for lunch and then went to our expat friend's for dinner and they made these incredible sweet potato casserole soufflés and I vowed right then and there to make it a part of our Thanksgiving tradition. And so, for the last 6 years I have recreated these delicious treats. And after 7 years total, I feel like its loooooong overdue time I shared this recipe with you. These are really not that difficult, they are just a little labor intensive. BUT you can do the hard part ahead of time which I did this year for the first time ever, what have I been doing with my life?! and it made the process so simple! 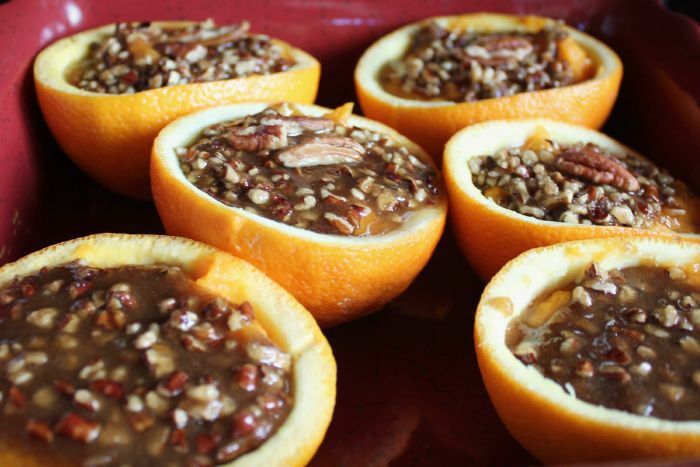 Basically, you hull the oranges, fill them with sweet potato casserole, top them with a delicious pecan crust pronounced by me as PEE-can if you're interested, and bake for 30 mins in a water breath. Ok, don't think I'm weird for explaining this part, but I'm gonna take a second and dig in pun intended to the whole hulling the orange part of the process. First, you cut the oranges in half, or just cut the top of the orange off, depending on the size of your oranges. The trick is using either a grapefruit spoon or a pointed spoon and getting between the orange pith (that white part) and the rind. I usually hull the oranges over a large bowl and scoop out a little bit at a time starting at the edges. Once I get a good chunk out I just follow around the edge. 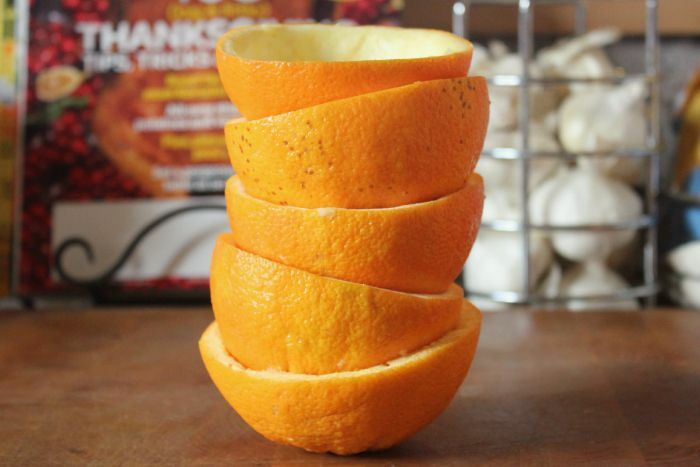 You have to be careful because the middle of the orange is connected to the bottom and if you're too rough, you can pull it out and put a whole in the bottom of your orange. I often use kitchen scissors to cut off the middle part. Don't feel like this has to be perfect. The orange rinds are filled so no need to stress it. See what I mean? No need to be perfect! If you happen to put a hole in the bottom of your orange, its ok... you can wrap it in foil when you cook it and it should be fine! If you are making these ahead, after hulling all the oranges you can just package the orange peels in a ziplock and store them in the refrigerator over night. The sweet potato casserole inside these is so delicious and unique! 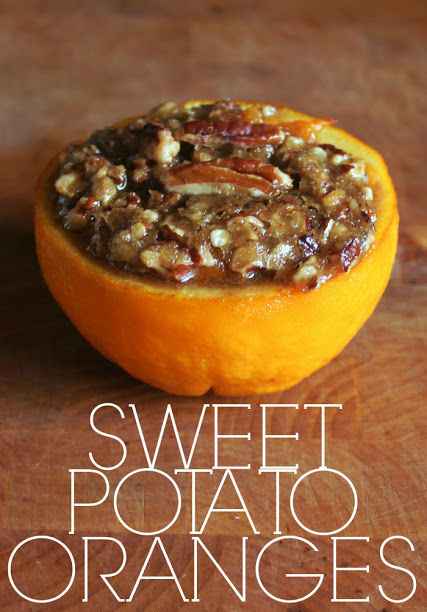 Its sweet but not too sweet and the orange flavor really compliments the sweet potatoes. Its so moist and fluffy since its cooked in the rinds. I always make sure to squeeze the rinds tightly into a deep dish because they shrink up a little in the oven. And the pecan crust topping? The nutty, sugary crust is so delicious and the perfect contrast to the citrus in the sweet potatoes. There is just a smidgen of flour in the topping so if you are gluten free, you can just leave it out. I made a batch tonight that was half and half and just marked the ones that were gluten free with large pecans. If you run out of oranges and still have a ton of mix, you can always just put the extras in a buttered baking dish and cook them right alongside! Seriously, friends... you need to include these as part of your holiday traditions from now on! Peel and quarter sweet potatoes. Put them in a large pot. Bring to boil and then boil for 20 mins. Drain. Mash sweet potatoes with a masher or an electronic whisk. Cut the oranges (either in half or by cutting off the top 1/4th of the orange. Use a spoon to hull the orange flesh out, leaving just the orange rind. Make sure to reserve 1/4 cup of juice. Place the orange rinds tightly in a deep baking dish. Combine sweet potatoes, sugar, orange juice, eggs, vanilla extract, butter and zest. Whisk to combine. Spoon the mixture into orange cups, leaving room for topping. Mix butter, brown sugar, flour and pecans in a small saucepan over medium heat, stirring occasionally, until sugar is fully dissolved. Spoon over casserole. Fill casserole dish with approximately 1/2 inch of water (make sure to not get water in oranges) Bake in preheated oven for 30 minutes. These look amazingly good! Thanks so much for sharing your recipe. I signed up to do sweet potatoes this year and I'm def bringing this...it's perfect for my fam...who happen to be citrus farmers. :) they'll love it!! thanks for sharing. omg this is amazing. 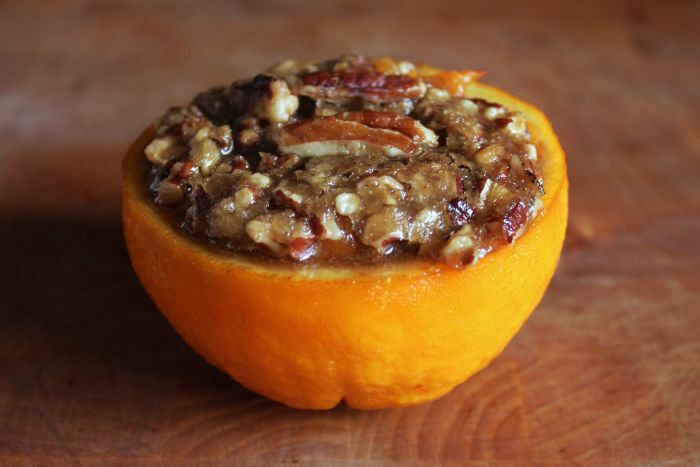 i was going to do something with sweet potatoes and pecans... i'm doing THIS! This looks beyond yummy! 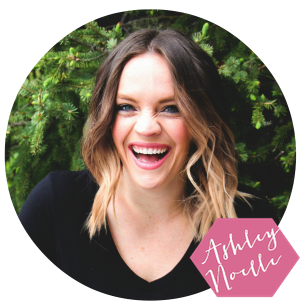 Thanks for sharing the recipe, Ashley. I have never sweet potatoes and orange together before, but I sure want to! This looks SO good!